WHILE many of us have sang along to The Cranberries’ biggest hit song Zombie, few of us are familiar with the tragedy that inspired Dolores O’Riordan to write it. O’Riordan died yesterday morning in a London hotel room, on a day the 46 year old was due to record her vocals for a new version of her iconic hit Zombie. Written during the band’s UK tour in 1993 and released the following year, Zombie is in memory of two children killed in an IRA bombing in Warrington, Cheshire. Two bombs detonated within a minute of each other in litter bins on Bridge Street on March 20, killing three year old Johnathan Ball and injuring 12 year old Tim Parry who died five days later. The IRA claimed responsibility for the attack, but insisted they had given two warnings prior to detonation and police had failed to act in time. Moved by the violence, the Limerick singer penned the five minute song in a seething condemnation of the IRA and a visceral response to the death of two young children. “I remember seeing one of the mothers on television, just devastated,” she told Vox magazine in 1994. O’Riordan was particularly offended that terrorists claimed to have carried out these acts in the name of Ireland. “The IRA are not me. I’m not the IRA,” she said. “The Cranberries are not the IRA. My family are not. “I don’t care whether it’s Protestant or Catholic, I care about the fact that innocent people are being harmed,” she told Vox. “That’s what provoked me to write the song. She later told NME in 1994: “[Zombie] doesn’t take sides. It’s a very human song. This morning, Tim Parry’s father Colin Parry told Good Morning Ulster that he had been touched by the lyrics did not realise they were written about his son until after O’Riordan’s death. “Only yesterday did I discover that her group, or she herself, had composed the song in memory of the event in Warrington,” he said. “I was completely unaware what it was about. “I got the song up on my laptop, watched the band singing, saw Dolores and listened to the words. “The words are both majestic and also very real. “The event at Warrington, like the many events that happened all over Ireland and Great Britain, affected families in a very real way and many people have become immune to the pain and suffering that so many people experienced during that armed campaign. “To read the words written by an Irish band in such compelling way was very, very powerful. “I likened it to the enormous amount of mail expressing huge sympathy that we received in the days, weeks and months following our loss. “Proportionately a very high total of that came from the island of Ireland,” he said. 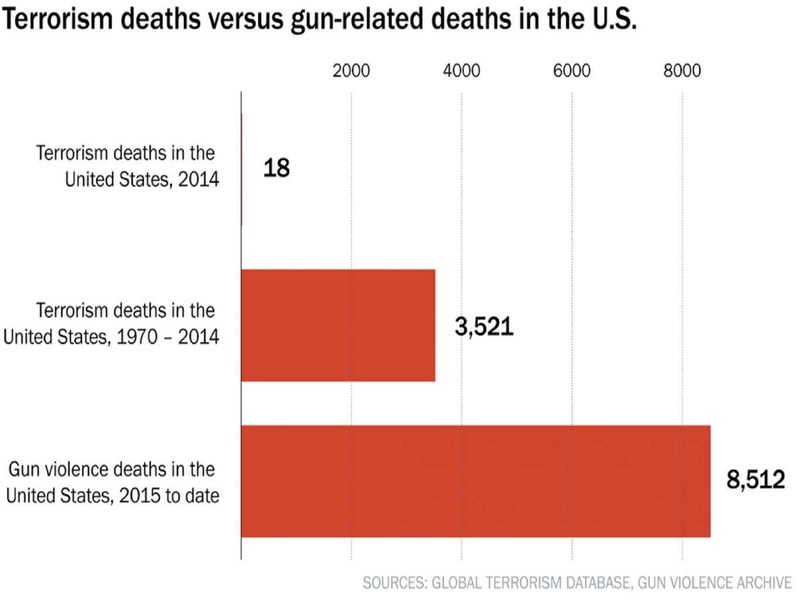 In an interview with a local television station in Philadelphia in August, President Obama drew a distinction between the effects of gun violence and terrorism. – Of course, terrorism was a major threat but nothing happened ! – no invading aliens? No zombies? And no Mars Attacks !